What a great time I have been having in Kylie Bertucci’s Aim for Alaska Group. I have learned so much from the guest “speakers” and the other members. It’s going to be sad when it ends! It’s been a challenge to put it all in to practice but in small bites you can do anything… even eat an elephant. So, thank you for taking time to stop by my blog today. Our theme this month is a sneak peek at projects made using our favorite items from the new catalog. This new catalog is so great, how on earth can I choose just one? But, then again… when people keep asking if I have seen a certain set, something about that set may just mean it’s a set made especially for me! And, if you follow me at all, you should know the set I am talking about!!! 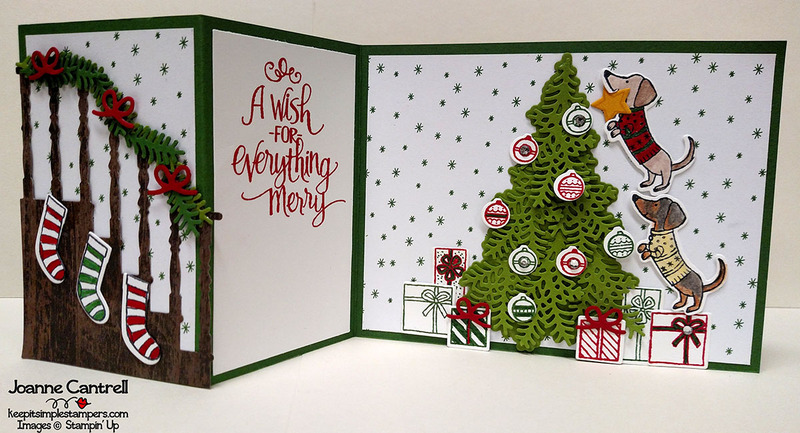 Why, it’s the Ready for Christmas Bundle (146056) which includes the Ready for Christmas Stamp Set (144823) and Christmas Staircase Thinlits (144679). Do you see that little dachshund? Yep, that’s why it’s the set for me! So, here are a couple of the projects I made with this bundle. Are those little puppies putting the star on top of the tree just not the cutest little thing you have ever seen!?! Here is the card open! And that font in that sentiment is so lovely! 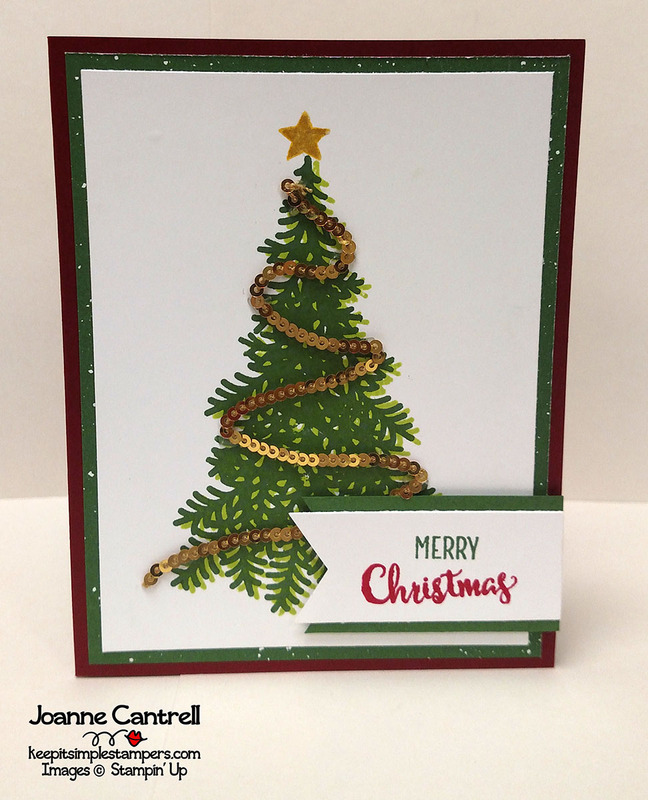 This card uses the branches from the Christmas tree. I made ring with the 2″ and 1-3/4″ circle punches then used some Snail to attach the branches to the ring. The berries were made with the 1/8″ punch. The sentiment came from the Labels to Love set (144970/144967).. Thank you again for visiting my blog today! Jump through the rest of the blogs using the list below! Until nest time… keep it simple, Stampers! 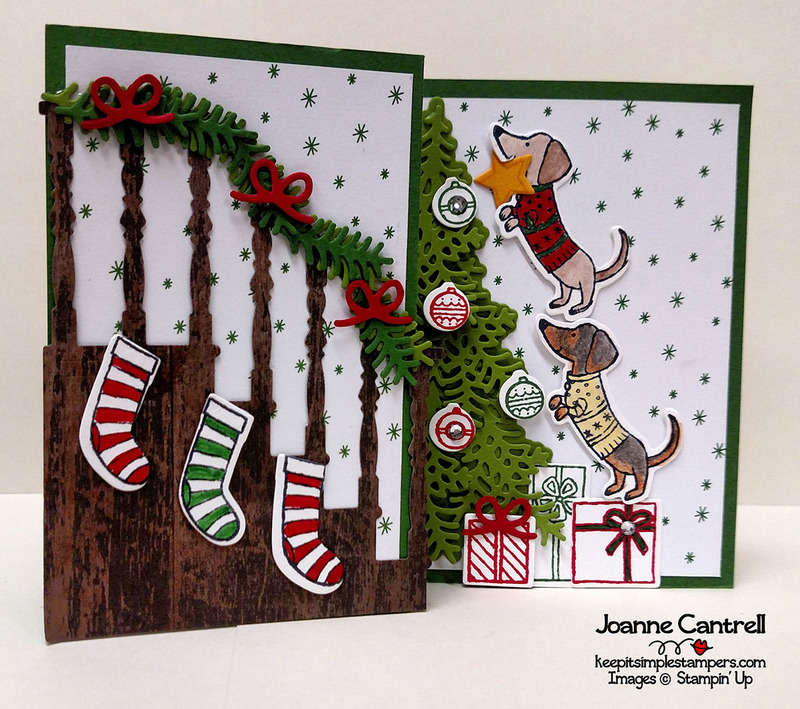 Joanne, Your cards are very cute especially the dachshunds. These are so lovely Joanne…..am definitely going to have to buy this set. Oh, Joanne! I like them all. Well done! What are the dimensions of the card? Which card in particular? The Top card has the same dimensions of 5-1/2″ wide and 4-1/4″ tall. 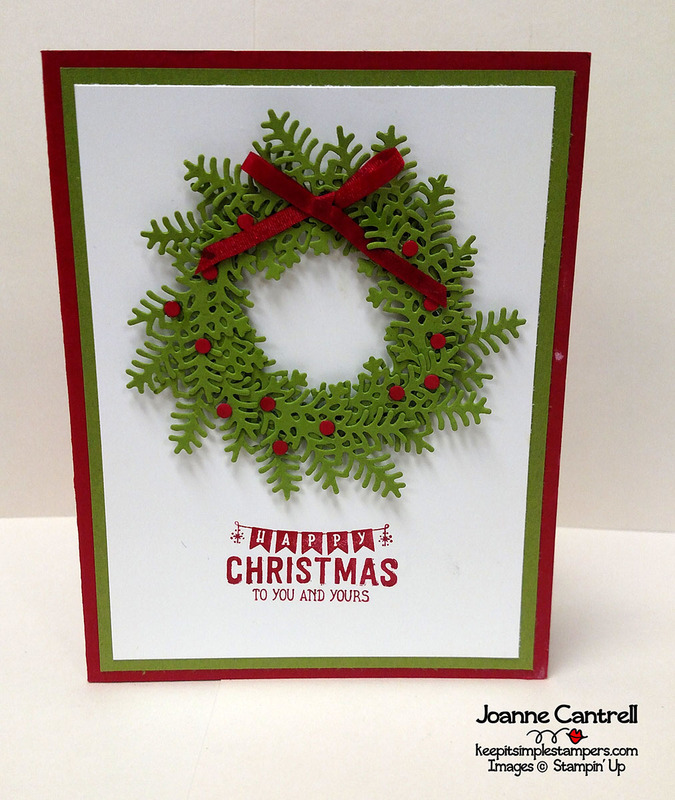 The second score is at 2-1/8″ to put it in the middle of the card front. Thanks! Yes the top one with the tri-fold. The one with the puppies. Question What paper did you use for the background on the tri fold card and what are the score dimensions for that card as well. It is adorable. Question what is the background paper that you used on the trifold card. Also what are the dimensions for that card plus the score lines. Love these ideas. Especially love the name of your group! I am definitely a K.I.S.S. kind of stamper. Have had this set for a year and hardly used it. Now I believe I can do it! Of course you can do it! I love this set. I am pulling it back out this weekend to do more with it! I raise little Dachshunds, so it’s my favorite set!